Lighting & Signs - Darmax Inc. 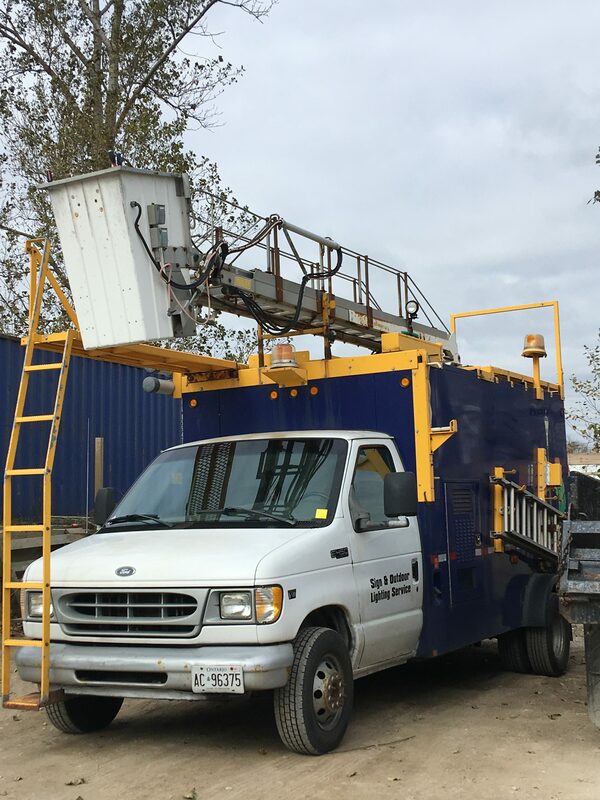 The most recent addition to the Darmax Inc. operation is our Lift Truck and in-house lighting Electrician. Now we're able to service almost all lot and building lighting needs as well as installing and maintaining many types of exterior signage. A well-lit, well cared for property is an invitation to tenants and patrons. It gives them the sense that they can safely and comfortably conduct business there. On the other hand, a poorly lit property is an invitation to liability claims and increased maintenance costs as you pay for cleaning up dumped items, graffiti and other possible property damage. The choice seems fairly easy if you look at these two options! You can read more about exterior lighting on our blog. In addition to the services below, we support several of our partner trades with the supply and services of our lift truck. Hanging of banners for events and promotions. Contact us today to request service or to discuss your exterior lighting needs.